Selling software can be extremely difficult in today’s tumultuous business climate! Enterprise software sales is an extremely competitive and complicated industry that is constantly changing. Buyers can be skeptical and are always expecting the best technology at a great price. deal. Additionally, buyers have more options and are always looking for the best product and service while your sales cycles continue to get longer. Some enterprise software buyers are Leary and skeptical about the words, deeds & integrity of many software salespeople. Some buyers have likened software sales people to “used car sales people”; they will say and promise anything to get the sales. Those days are over and done with. As a software sales professional, you have to understand the potential client’s business issues and have a deep understanding as to how your software solution will add value and produce a substantial ROI in a short time frame. At The Sales Coaching Institute, our high-tech sales training and coaching process was developed by software sales professionals with real world experience. Our software sales training and coaching provides a strong foundation for your sales team members and those within your organization who influence sales. Our sales training professionals mentor, coach and motivate your sales staff, helping them develop and implement new and elite sales processes. We break problems down into their simplest form and analyze them to uncover the simplest and best solutions. Our sales coaching for software companies and sales training for enterprise software companies is always customized to fit your organization’s technology, culture, and customers. If you need help selling a technical product, contact us today. Management is equally, if not more important to the success of a sales force. The above aspects directly impact your ROI. Most salespeople are driven by goals, results and/or sales compensation. Our closely monitored sales training and sales assessments uncover the things that motivate employees to sell. Not only do we uncover these motivators but we will also discover new methods of motivation that will allow them to improve sales. This helps them adapt their actions to clearly communicate crucial facts and needs to their clients/prospects. This results in more sales and higher employee morale as commission checks rise and the company is increasing production. Creating parallel goals and objectives between sales professionals and the organizations they work for, generating a definite advantage. Mentoring the sales staff and management staff and designing custom programs to help meet set goals and objectives. 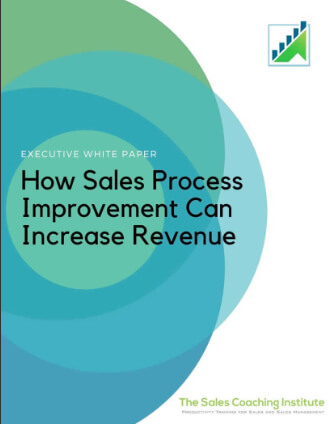 Developing a new and elite sales process that revolves around a performance driven team. Consulting and further mentoring the entire organization and sales force to improve interconnectedness to stabilize your process. Breaking down problems into their simplest forms to create effective solutions. All content is custom and specifically developed for each organization and industry that we work with. Please Contact The Sales Coaching Institute for a complimentary sales force audit.